In Los Angeles, I improved my 5000m personal best by four seconds. Last week, I competed at Mt. 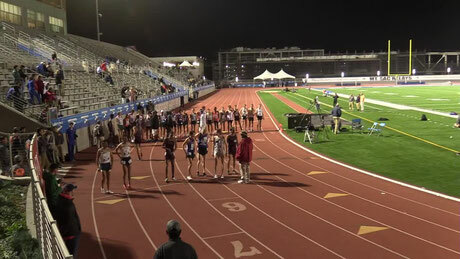 Sac Relays, one of the most competitive races in the US. Since this meet is every year insanely fast, every athlete just has one goal: to run a clear personal best. This was obviously my goal too. I was entered in the fourth head, the last race of the night. My start from lane 2 was extraordinary bad. I started out in a decent speed but was surprised by the intensity. Following that I got pushed around a bit more that I was planning to. I passed that first 200m right on pace but I was already 20th position, far away from the front. After that, I was aware of the physical style of some athletes and could handle the situations better. I passed one kilometer in 2:52, similar to my race in Austin. Over the next laps, I kept on moving up an passed K3 in 8:37, seven seconds faster than three weeks ago. I could maintain that pace over the last laps and finished the race in 14:18, four second faster than ever before. Despite the new PR, I was first more disappointed about the start and some more opportunities, I missed, to run faster. Nevertheless it is a new and that means I am a little closer to break 14 minutes. Unfortunately, on our travel back to Denton, I caught a cold. To make sure, to be ready for conference, we decided not to compete this week in San Marcos.